The inspiring story of a young immigrant and IB student who used poetry and women’s issues to integrate into a new society. This is an excerpt from a poem by Marylise Habiyambere, an IB student who moved with her family from Rwanda to Canada back in 2007. 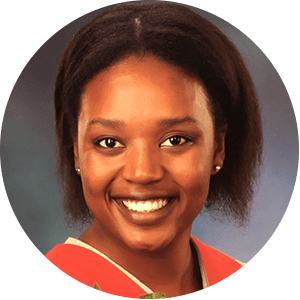 Now 18 years old and studying the IB Diploma Programme (DP) at Saint John High School, in Saint John, New Brunswick, Marylise first embraced poetry as a way of dealing with the stress of being an immigrant in a new country, and a new school. A strong feminist, she has also established a club at her school which promotes women’s issues. Here she tells her amazing story. I was born in Rwanda but I have no recollection of my time there. My family and I left while I was still very young. I arrived in Canada aged seven years old. My family and I lived in Fredericton, New Brunswick, for a while before moving to Saint John, where I currently live. Most of my schooling until then had been done in French as that is my first language but I decided I wanted to attend an English-speaking high school. I chose Saint John High School because they offered the IB programme. I wanted to have a very rich secondary school experience. Enrolling in the DP seemed like the best option. My transition to Canada was anything but smooth. It was through poetry that I was able to overcome such a difficult period in my life. When I first started writing I didn’t interpret it as poetry. To me, I was just writing to relieve myself of the bottled up emotions that were weighing me down. At the time, I didn’t feel a need to share my poems. It was more therapy than anything else. But then, one day, in grade 7, I shared one of my poems with my French teacher and he told me that I had a talent for poetry and that I shouldn’t stop writing. So I didn’t stop. I’ve been writing poetry ever since and I’ve become more open to sharing the poems with others, even when I don’t feel like they’re worth reading. About a year ago I started submitting my poetry to magazines, entered poetry contests and started an Instagram account for my poetry (@paperglue_). Poetry became a part of my identity. It was my coping mechanism of sorts, and although I am highly critical of my own work, I haven’t let that stop me from writing. My proudest moments would have to be having my poetry published in the Poetry Institute of Canada’s Young Writers of Canada anthology, The Heart of Solstice, and when my poem Passages of the Heart received second place in the Poetry Institute of Canada’s 2016 National Poetry Contest. My interest in women’s issues and gender equality began when I entered high school. I can’t pinpoint what exactly catalyzed this sense of responsibility that I felt to advocate for women’s rights. I think it may have been in part due to the sheer number of articles I read about issues such as genital mutilation and child marriage being faced by women and young girls around the world. I felt this need to play my part in ending gender inequality. I started a feminist club at my school in grade 10 with the intention of creating a space of empowerment for young girls and starting a conversation around gender issues within the student body and the community. Our first feminist club project was a feminine hygiene product drive. I recognized there was a lack of feminine hygiene products being donated to women in my city who needed it most because it is not something that is really acknowledged by most charities. We collected donations such as tampons and pads from teachers and students over a month-long period. The donations were then given to a local women’s centre. The project started a conversation about periods – a subject which is often stigmatized – and provided the women at the centre with hygiene products. I continued the project in my grade 11 year and will be doing the same for my final academic year. I think being an IB student really helped me become a more globally-minded student. It has helped me understand the need for youth to think critically and reflect on the issues being faced around the world, and how we can address them in our own lives. Being an IB student also helped me become a better risk-taker which allowed me to jump into projects without overthinking them. I will be attending the University of British Columbia in the fall. I plan on studying psychology and philosophy with the intention of attending medical or law school later on. I can see myself going back to Rwanda and contributing in any way that I can. Read more poetry from the IB community.